The balancing act between the Republican establishment and the activists who have gained prominence in the Tea Party movement has been unfolding for nearly two years, testing a party that wants to corral its enthusiasm without alienating moderate voters. Despite the concerns of the Republican establishment, some evidence suggests that the G.O.P. is especially likely to nominate a strong conservative in 2012. In The Party Decides, the political scientists Martin Cohen, David Karol, Hans Noel, and John Zaller argue that one thing is likely to make political parties nominate a centrist: losing. Specifically, the longer a party is out of power—that is, the more presidential elections it has lost in a row—the more likely it will nominate a moderate candidate. Parties that have been out of the White House for only a short time are more willing to nominate a candidate closer to the ideological pole. 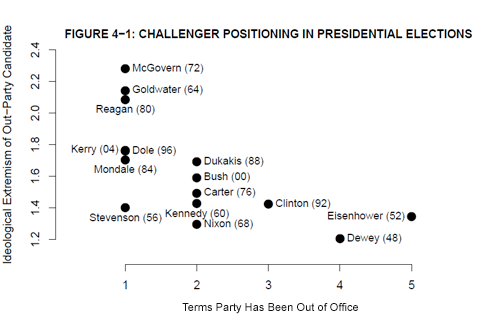 The authors draw upon both surveys and expert estimates of presidential challengers’ ideological positions. These candidates were rated on an ideological scale. Mr. Cohen and his colleagues then calculated the distance between each candidate and the center of the scale. On this scale, a candidate at the center would be at 0, and a candidate at the ideological endpoint would be at 4. The resulting measure is relative in nature; it doesn’t tell us where, exactly, the ideological center is in American politics or whether the center has itself shifted over time. But, it still helps to identify whether candidates are closer to or further from the center. The graph demonstrates that for each election that a party loses, its nominee get closer to the center of the scale. For example, in 1984 and again in 2004 the Democratic Party had been out of office for only one term. The party nominated Walter Mondale and John Kerry, respectively. But in 1992, having been out of office for 12 years, they nominated Bill Clinton, who was probably more centrist than Mr. Mondale or Mr. Kerry. Of course, this evidence hardly portends that Rick Perry will win and Mitt Romney will lose. But it does suggest that 2012 could be a year in which the GOP does, to quote Mr. Cohen and colleagues, “test the limits of voter tolerance” by nominating a candidate like Mr. Perry. The authors’ data would suggest that for conservative activists, this is likely their best year to nominate their preferred candidate. A loss to President Obama in 2012 would probably only empower the more moderate “Republican establishment” in 2016.